As fast-food giants like McDonald's struggle to get their sizzle back, fast-casual restaurants like Chipotle and Shake Shack have flourished. Fast-casual revenue grew 13 percent in 2014, 10 times that of restaurants overall, with growth of 1.3 percent, according to Technomic, a restaurant market research firm. 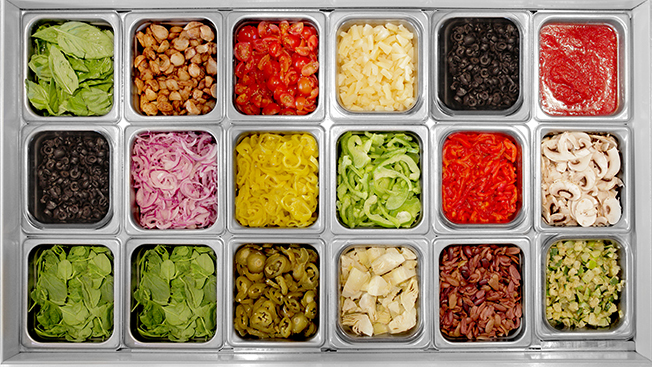 An even hotter trend within the fast-casual segment: build your own. The format was up 22 percent in sales in 2014, compared to 11 percent for made to order. Chipotle ignited the trend, captivating diners who sidestep down assembly lines picking burrito ingredients from employees behind the counter. In 2014 it increased its restaurants in the United States 11.6 percent, to 1,755. But the most dramatic success for the format these days is with pizza, where toppings are selected—usually unlimited for a fixed price—for personal pies that are fed into gas-fired ovens that are 800 degrees and hotter, cooking in about three minutes. Blaze Pizza, with celebrity investors including LeBron James and Maria Shriver, grew from just two units in Southern California in 2012 to 67 restaurants nationwide (and two in Canada) today. 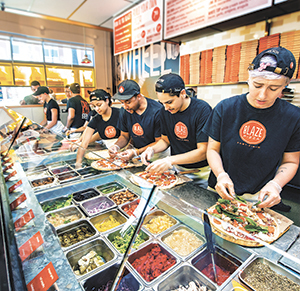 "Historically for pizza every topping cost you a little bit more, but what's different with the fast-casual artisanal down-the-line pizza category is you can choose any toppings all for one price," said Jim Mizes, president of Blaze. "And with millennials, they are all about customization." Most traditional pizza chains are dinner operations since consumers view them as taking too much time for lunch hour, but Blaze's speediness has helped it ace lunch, which accounts for half its volume. Also thriving is its dine-in business, with about 70 percent of Blaze pizza consumed in its restaurants, roughly the inverse of pizza chains, which box about 85 percent of their pies for take-out and delivery. Fusian has three locations in Ohio. Pieology Pizzeria, a self-described "pie-oneer" in the customized pizza segment founded in 2011, grew from 15 units in 2013 to 62 today, with projections to grow to 110 by year's end. Founder Carl Chang said that in an era of Iron Chef, we have come to see food preparation as a form of performance—in which case the sneeze guard is just another screen for content. "Many people like me are Food Network fans, and they love being exposed to how our food is prepared and our technique," said Chang. Other build-your-own pizza chains on the rise include PizzaRev, Pie Five Pizza Co. and MOD Pizza. Darren Tristano, evp of Technomic, said customization has come a long way since a certain sandwich shop championed it. "Subway introduced it, Chipotle perfected it, and pizza restaurants like Blaze are really evolving it," said Tristano. "The new evolution is not just assemble—it's assemble and cook to order." Chris Arnold, communications director for Chipotle, says many miss the point when they evoke the brand. "A whole lot of restaurants position themselves as the Chipotle of 'X,' like the 'Chipotle of Mediterranean' or the 'Chipotle of burgers,'" Arnold said. "What they tend to mimic more than anything else is the service format and the price point, but that's not what really makes Chipotle work. 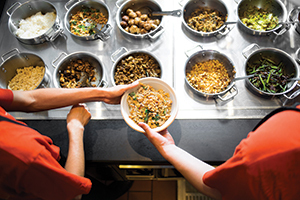 What makes Chipotle work is finding the very best ingredients, preparation and a culture that allows our employees to create real, meaningful careers." For its part, Chipotle has its own spinoff, ShopHouse Southeast Asian Kitchen, which features customizable rice, noodle and salad bowls. Ten are open, with more on the way. Genghis Grill grew its build-your-own stir-fry footprint to 115 restaurants in 2014, a 7.5 percent increase over the previous year. Other build-your-own approaches include My Ceviche where raw fish is mixed in with other items in a bowl, and Crazy Bowl & Wraps with grain-based bowls. 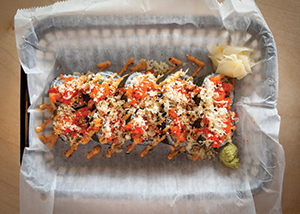 Even sushi is getting the customization treatment, with chains including Fusian in Ohio. Ting Yen, who recently opened his second Sushi Fuku in Pittsburgh, explained that automation—one machine forms a portion of rice into a sheet and another slices a roll into 10 pieces—allows a customized sushi roll to be assembled and plated in about a minute. His lunch business, notoriously slow for sushi restaurants because the rolls can take so long to prepare, accounts for 60 percent of his business. "Typically people don't eat sushi for lunch because it takes forever," Yen said.